Dhaka, July 11 (Just News): The opposition BNP on Tuesday alleged that election commission’s secretary Helal Uddin Ahmed is 'working in favour of Awami League' and now running the commission. "You (govt) are now running the election commission with a secretary. Helal Uddin was appointed as the election commission secretary from the secretariat in a special way," said BNP secretary general Mirza Fakhrul Islam Alamgir. Speaking at a discussion, the BNP leader further said, "I've heard he, after attending office until 4pm, used to go to a certain party's a special office where the party's all election plans are worked out headed by HT Imam." Pro-BNP student leaders of Dhaka University Central Students Union (DUCSU) and All- Party Students Unity (APSU) of the 1990s arranged the programme at the Jatiya Press Club demanding the release of BNP chairperson Khaleda Zia and her proper treatment. 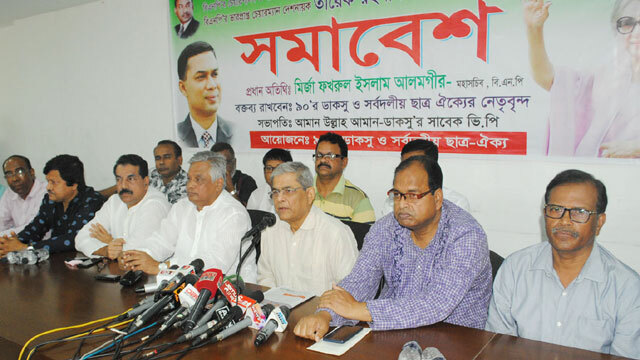 Fakhrul alleged that the current election commission has no authority and capability to hold any credible election. "It couldn't yet hold any election in a fair manner." About their party's stance on the 11th parliamentary polls, he said BNP will not join it without having Khaleda Zia released from jail. "The government must release her and withdraw all the cases filed against her." The BNP leader said they will surely participate in the polls if the government meets their minimum demands for creating a level-playing field, dissolving parliament, installing a non-party neutral government and deploying the army personnel. He called upon all the political parties and people from all walks of life to get united to resolve political crisis, restore democracy and their basic rights. "We believe people will get united and defeat the government." Fakhrul alleged that the government is running the country abusing the state machinery as it has lost ground beneath its feet. He criticised the Dhaka University authorities for imposing restriction on roaming, staying or carrying out any activity on the campus by outsiders without prior permission. "Dhaka University is not only an educational institution but also a premier place for exercising free thinking." Stating that Dhaka University always showed people the right path during any crisis, Fakhrul said now that university is fettered. "The move has been taken as part of a plot." The BNP leader also accused the ruling party 'cadres' of torturing and suppressing those involved in quota-reform movement. "Those who waged the anti-quota movement are now on the run to save their lives. One of them remains missing while another was taken on a 10-day remand. Two legs of a demonstrator were broken with a hammer."